Forging diplomatic ties with the right answer were Anne, Minoru and Mary. This week we have a famous three-wheel car that bizarrely has been the rounds of pub car parks in my local area! 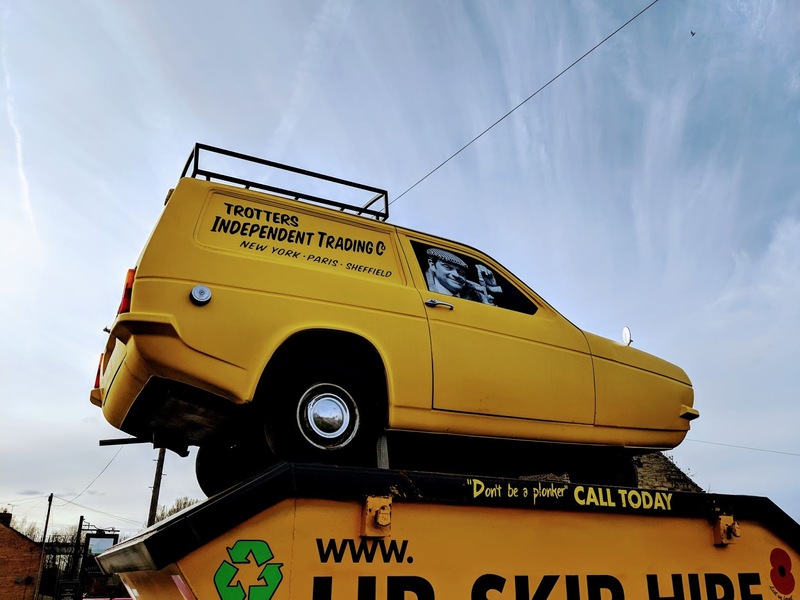 The battered yellow Robin Regal was a familiar sight on British television between 1981 and 2003 as it went round the streets of Peckham. Its owner was one Derek Trotter who liked to be known as 'Del Boy'. The sitcom was based on his exploits as a market trader who tried to make money selling a series of random but usually either broken or stolen goods. He was assisted by his much younger and long suffering brother Rodney. Living with them in their high-rise council flat in Nelson Mandela House was their scruffy Grandad who when not betting on the horses or watching TV acted as general dogsbody. After his death they were joined by his brother, Uncle Albert, and his endless tales of his misadventures as a sailor during the war. Del Boy had a series of catchphrases such as, “This time next year we'll be millionaires,” based on his continued aim to get rich through his dodgy deals. “Lovely jubby” and “cushti” became common expressions of delight along with the insult, “You plonker!” which he usually reserved for his hapless brother. He also believed he was linguistically able and in particular in French. However, this resulted in him saying, “au revoir,” for hello and, “Chateauneuf du Pape!” as an exclamation of surprise. What is the name of the television programme that featured the yellow Robin Regal? We were joined last week by Susan and some dressing up. Soma has been remembering a visit to Oxford. It's blossom time for Sarah. A favourite view for Mary is at Stowe Landscape Gardens. Minoru has been continuing their trip to Portugal. In New Zealand Betty has been looking at the fabulous ocean. It's been swimming gala time for Kara plus a look across the countryside. Sarah celebrated Mother's Day with a bouquet of flowers. An orange clivia flower was one of Sara's favourite images this week. Finally, Jesh was feeling vertically inclined. If you want to join in with this week's Sunday Snap then add your link to the linky below. Any theme is allowed. It doesn't have to be published today as you have until 23.55 on Friday 12th April 2019 to join in. Grab my badge below for your blog post. Just make sure it is your photo and you hold the copyright for it. It's Only Fools and Horses. What a classic show! Am I the only person who can't bear Only Fools & Horses?! And now it's a musical in the West End - totally baffled by it, always have been. Hi! It is difficult to find the ansew. Thanks for sharing. Thank you for your comment, Ness:) And thank you for hosting!